Healthdip.com - Health & Fitness: Stress at Work Place – How to Get Rid of Job Stress? 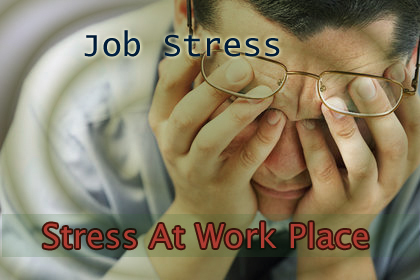 Stress at Work Place – How to Get Rid of Job Stress? These days stress is very common for working people. Job work pressure and timing issues are key factors of stress. It is a fact that we never leave job or business due to stress. So we should try to remove stress from our life. We work for whole day or night in office, but without physically and mentally fitness, we can't produce best results. In Current generation stress level goes high because of hectic work schedule, daily work pressure and busy lifestyle. Here are some important tips to avoid stress at work. Take a break when you found yourself in tough situation. Refresh your mind and body by taking coffee, tea or juice and go for a small walk for 5 to 10 minutes inside the office compound or outside with your colleague. It reduces your stress level and increases your energy level to do work with refreshed mind. You should go for morning walk, jogging, yoga or gym on daily basis. Do daily physical workout to make your body and mind energetic. On a scientific note, when you workout, your brain releases endorphin, a hormone that is known to mask pain and stress. Yoga is the best way to get rid of stress and energize your mind and body for long time. To avoid stress you should try to take healthy food, fruits and juices. Do not avoid your breakfast, lunch or dinner at any cost. If you do it, you feel week and laziness and feel sleepy for whole day. Always enjoy your lunch time with your favorite foods with friends and go for walk for half an hour. It can help you to get rid of job stress. Enjoy your weekend by going to your favorite places, go for long drive, take your favorite food, and meet with your friends or family. It energizes your mind for next week and put can stress outside from your life. Do some new activities at daily basis to divert your mind from work pressure. Try to cook new dishes, painting with your baby, try to sing a song, dance or any other activity which remove stress and give energy for whole day. Try to keep energetic yourself and forgot what is stress. We all have work pressure in life but stress is not a part of our life. We can avoid stress by doing some efforts. There are so many ways to keep us away from stress that we can apply by our self and no need to ask, How to get rid of stress. Its really great post about stress at work place. Now days it common for all working people. Thanks for sharing important tips to avoid job stress.